Democratic Convention Draws Troubled Homeowners As Democrats gather for their national convention in Charlotte, N.C., troubled homeowners have also converged on the city. They have come to voice their dissatisfaction with how the Obama administration and the nation's big banks have handled the foreclosure crisis. 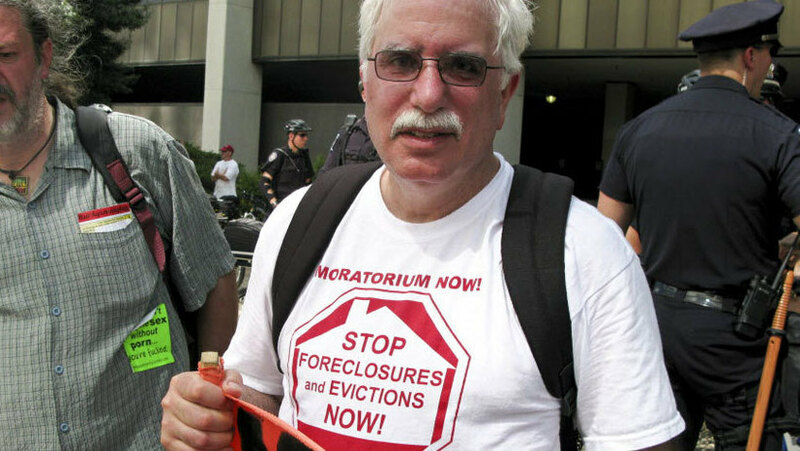 David Sole rode a bus from Detroit to the Democratic National Convention in Charlotte, N.C., to protest how the Obama administration and the nation's banks have handled the foreclosure crisis. Charlotte, N.C., host of the 2012 Democratic National Convention, is the nation's biggest financial center outside of New York. But Charlotte and surrounding Mecklenburg County have the highest foreclosure rates in the state, and many thousands of homeowners owe more on their homes than the properties are worth. As thousands of Democrats converge in Charlotte for the convention, some troubled homeowners have also gathered, lamenting that the foreclosure crisis has not been sufficiently front and center in the presidential campaign. Mike Shane and 40 other homeowners bused down from Detroit Sunday to protest in the long shadow of the towering Bank of America headquarters in Charlotte. "My neighborhood is devastated by foreclosures," Shane says. "I live on a block that, at one time, seven out of 19 houses were in foreclosure." Shane and others from the Moratorium NOW! Coalition want Obama to use his powers to halt foreclosures. "I'm underwater," Shane says. "I owe $120,000, and houses one or two houses [away] from me are selling now for [$10,000] to $20,000." Shane, an engineer for an automaker, says his beloved city of Detroit has gone to waste as housing prices have fallen and people have lost their jobs. With the presidential candidates more or less mum on the subject, he says, he's still searching for someone to vote for. I'm actually quite disgusted with both parties. I think they're captive of the big banks and the financial interests of this country. "I'm actually quite disgusted with both parties," Shane says. "I think they're captive of the big banks and the financial interests of this country." Shane is current on his mortgage. But a few miles from the protests downtown, Charlotte resident Jessica Sanchez and her family face worse circumstances. Jessica has spina bifida and other medical problems that keep her in a wheelchair. When her parents bought their house a dozen years ago, they customized it with a ramp, new doors and other changes to meet Jessica's needs. But now, they may have to leave the home. The family fell behind on the mortgage paying her medical bills, and now the bank is preparing to foreclose. For the past year, Jessica's Spanish-speaking parents have relied on her English translations to help fight to keep the house. "My mom and dad are trying to fight with the bank," Jessica says. "They're trying to take it away because we owe $20,000. They want $20,000 by Sept. 14." The family is hosting a barbecue to raise money and awareness. So far, they've raised just over $400 selling food and washing cars. And at 17, Jessica has become a teen expert conversant in the family's mortgage and personal finances. "We pay the house, or we pay my medical bills and my medicine," she says. "Or we buy food, because we can't do everything at the same time." To Jessica, Washington, D.C., is a city she once visited for a fifth-grade school trip. She fondly recalls Ford's Theatre and the Lincoln Memorial. But Jessica does not consider Washington the place where she will find solutions to her family's dire housing situation. "Everybody in the United States should be living in a home, under a roof," she says, fighting tears. "Not on the roads, asking for money." Outside on the porch, fellow Charlotte resident David Johnson is here in solidarity with the Sanchez family. Johnson is one of 14 million homeowners across the country who are underwater. He's had sporadic work since losing his construction job two years ago, and eventually, he could no longer afford his home loan. But the bank would only modify it, he says, if he fell behind on payments. So he did, but the new payments were still too high. Now, Johnson and his family stand to lose their home in November — just after the presidential election. "The Obama administration didn't do what they needed to do," Johnson says. "They put programs together and they put them out there. They just didn't put enough controls on it where it made a difference in my personal situation. So yes, that will affect my vote in November, for sure." Even so, Johnson says, it's not as though Republican candidate Mitt Romney is discussing housing, either. "I don't hear it talked about nearly enough," Johnson says. He says he recently found construction work, but even that is bittersweet. "The only thing that's getting funded to be built is apartment houses," he says. "You know why that is? It's for all the people that are getting foreclosed on, and that's a shame."